In his inaugural address President Robert J. Zimmer focused on the University’s enduring values—values, he said, that can be sustained only by anticipating and embracing appropriate change. 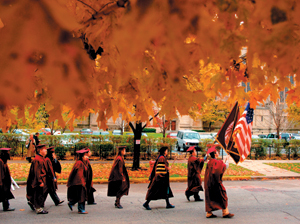 On January 2, 1893, the University of Chicago convened its opening convocation—Convocation Number 1. As you will discover in your program, this is Convocation 487, so quite a bit has happened here since that winter day in 1893. If we take ourselves back to the University in its early years, we would find many major differences from what we observe today. We would see remarkably different course offerings, research agendas, institutional organization, educational programs, and social, political, and global environments. We would discover familiar buildings but find them situated within a very different physical landscape, in a barely recognizable city and urban environment. We would not see the vast array of now familiar schools, departments, centers, institutes, intellectual endeavors, student activities, and community connections that is the focus of abundant energy and enthusiasm today. And yet many of us connected to this university feel that we might just as easily have been there—that going back to the University in its early days, or in fact at any time since its inception, we would know unmistakably that we were at the University of Chicago. Why is this? 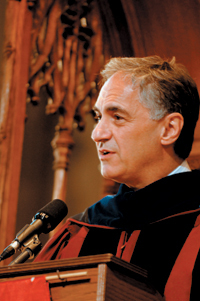 The University of Chicago, from its very inception, has been driven by a singular focus on inquiry—with a firm belief in the value of open, rigorous, and intense inquiry and a common understanding that this must be the defining feature of this university. Everything about the University of Chicago that we recognize as distinctive flows from this commitment: our belief that argumentation rather than deference is the route to clarity; our insistence that arguments stand or fall on their merits, not the background, position, or fame of the proponent; our flexible organization that fosters rigorous and imaginative analysis of complex problems from multiple perspectives; our education that embeds learning in a culture of intense inquiry and analysis, thereby offering the most empowering education to students irrespective of the path they may ultimately take; our commitment to attract the most original agenda-setting faculty and students who can most benefit from and contribute to our environment; and our recognition that our important contributions to society rest on the power of our ideas and the openness of our environment to developing and testing ideas. Following his formal induction as the University’s 13th president, Robert J. Zimmer delivers his inaugural address. These enduring values and fundamental principles of the University have shaped our culture and have informed generations of faculty, students, and administrators. They are so visible, so deeply embedded, and they so define our environment, in the past as well as the present, that with all the tangible changes in the University between Convocations 1 and 487, we believe we would recognize this university at any time in its history. At the University of Chicago, we know who we are as an institution. The words “open,” “rigorous,” and “intense” are easy to say, but one should not underestimate the challenges in actually creating, preserving, and enhancing such an environment. There is scant evidence that open, rigorous, and intense inquiry is the natural state of humankind. Openness alone is difficult. Even in institutions that prize it, sustaining openness is very demanding of members of a community. It requires listening when one is full of passionate conviction, a willingness to challenge one’s fundamental assumptions, and respecting the arguments of those with whom you strongly disagree. Additionally, it entails fostering, as a community, freedom of thought, expression, and argument when many forces, intentional or not, may align to create chilling effects. Difficult as it is to achieve, being open is not enough. One needs the intellectual and emotional fortitude for rigor, the intensity to pursue argument relentlessly, and the imagination to see connections that transcend accepted understanding. It is a special environment in which these are the primary values, and it is a very special university that embraces these values as its core and that has succeeded in sustaining and enhancing these values over its lifetime. While these are large principles, they play out in the work of individuals in the University community day in and day out. How the faculty approach their scholarship and teaching, how the students approach their education, how the administration and staff approach their responsibilities, how the trustees provide their oversight and support, how the alumni connect to the University and what they value about their experience, how our friends understand the distinctive contribution the University makes: the actions and decisions of the University community, as individuals and as a collective, reaffirm and renew our fundamental principles every day. 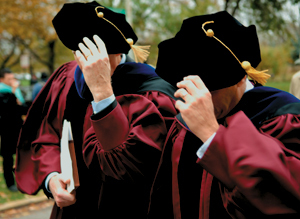 Board chair James S. Crown and President Zimmer hold onto their caps. The greatest long-term challenges to this environment are the inevitable and always formidable countervailing pressures of ease, accommodation, and complacency. Thus, the University’s ability to remain steadfastly committed to sustaining its values is a tribute to all those who have been part of and contributed to the University community over the years. It is a legacy whose value we must always reaffirm, and it is a community that I am proud and enthusiastic to rejoin. The culture these values have created, which permeates the foundations of every one of our schools, divisions, and the College, has had a profound impact because of the power of the ideas generated by our faculty and students. 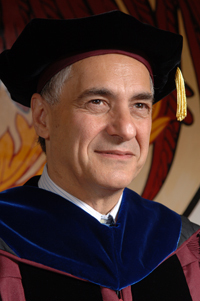 The Chicago name has been synonymous with defining academic disciplines, schools, and modes of thought, and the University has had a transformative impact on economics; science; energy production; medicine; law; business; religion; policy; historical, cultural, and literary analysis; and much more. It also has had a profound impact on individuals who have been connected to the University. We have trained College students, graduate students, and professional students with intensity and rigor, and for generations they have been empowered by this education and way of analyzing our world to become leaders in virtually every area of endeavor. This impact—on scholarship, on society, on individuals—is a clear demonstration of the power of the idea of the University of Chicago itself and the principles and values that guide us. Now I have known this about the University of Chicago for a long time, but it has a particular salience for me right now. One of the things you hear as you become a president of a university is how complicated the job is. Everyone is quick to point out that there are so many constituencies—faculty, students, staff, trustees, parents, alumni, friends, patients, the community, the city, the federal government—and so many tasks—ensuring academic programs flourish, recruiting the best faculty and students, building buildings, raising money, meeting with alumni, representing and protecting the University, dealing with globalization and changing technology, addressing diversity, working with the community and the federal government, balancing the budget, overseeing management not only of what is usually identified with a university but in our case also a major hospital, a major national laboratory, the largest academic press in the country, a major pre-K–12 private school, a charter school with three campuses, and an array of important institutional and personal relationships in the city and beyond. 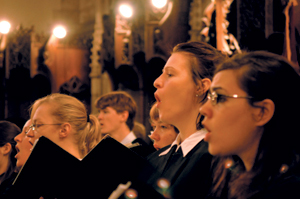 The choir sings Britten, Brahms, and the Alma Mater. While it is true that these are all features of this presidency, and in fact very important features, none captures its most central role. 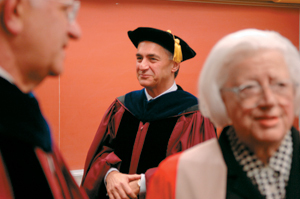 My core responsibility as president of the University of Chicago is—and has to be—to ensure that the University realizes its enduring values and fundamental principles in the most powerful and lasting way possible. So let me turn to the future, by first looking back again to see the lessons of change since 1893 in the context of enduring values. With the clarity of enduring values and principles, the University evolved through the often tumultuous transformations of the last century. Many at the University seized the opportunities and confronted the challenges presented by cultural, social, scientific, intellectual, political, institutional, and technological change. This includes the legendary figures who visibly forged the University’s history, but also many whose contributions have a quieter place in legend. Their collective contributions have brought us to where we are today. What is the lesson of this history of a university with such a clear set of enduring values? It is not that our predecessors discovered the right shape of the University once and for all, but rather that the University has flourished because those who preceded us acted with boldness, imagination, and discipline. They advanced the University and its values for the long run by making changes within the context of the opportunities and challenges of their time. Enduring values have been the guide to action, not a sanctuary for complacency. Enduring values have not been, and should not be, confused with enduring answers. 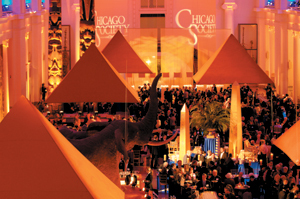 On the eve of the inauguration, the Chicago Society (a group of University donors) hosts a dinner at the Field Museum. It now falls upon us, the University of Chicago community of the present day, to act within the context of our enduring values with the same boldness, imagination, and discipline to seize the opportunities and confront the challenges of our time. To sustain enduring values, we must anticipate and embrace appropriate change. How should we bring to bear our analytic capacity, history, and culture—so conducive to confronting problems from a variety of perspectives—in new and imaginative ways to contribute to understanding the complex social, economic, cultural, and intellectual problems of our times? How do we participate in and lead the remarkable ongoing transformations in science—the revolution in biomedicine, the advent of computation as a conceptual and technical tool, and the breakdown of the boundary between science as the study of natural phenomena and engineering as the study of man-made artifacts? 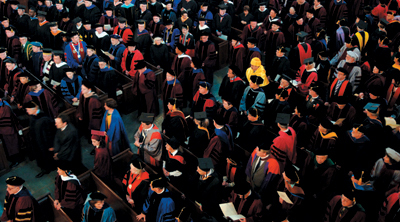 The 487th Convocation procession marches down University Avenue to a crowded Rockefeller Chapel. How do we advance the arts on campus and articulate the relationship between critical analysis, performance and production, and the connection to the city? How should our college, graduate, and professional education evolve to reflect shifting paradigms of inquiry across the disciplines? How do we ensure that our scholarly community is comprised of a rich mix of individuals who, through their own diverse experience, background, and viewpoints, contribute to the intellectually challenging culture of the University? How do we continue to support our graduate students, who are such an important component of our intellectual culture? How do we continue to enhance the programs in the College, which has seen such a remarkable renaissance, and continue to ensure access to a Chicago education independent of family financial capacity? Waiting for the procession to begin, Robert J. Zimmer is framed by two of his predecessors, Don M. Randel and Hanna H. Gray. How do we benefit most from and contribute most to our partnerships—with Argonne, the Field Museum, the Museum of Science and Industry, the Chicago Public Schools, Howard Hughes Medical Institute, and others? How do we approach international aspects of education in the context of globalization and build upon the Graduate School of Business programs and facilities in Singapore and London, and our University facility and programs in Paris? What is our strategy for simultaneously enhancing clinical medical care and biomedical research? How should our relationship with the South Side community, the city, and the region evolve? How do we communicate better with our friends, alumni, and external constituents to describe our culture and our achievements? How do we generate the resources necessary to support all we must do in order for the University of Chicago to remain a distinctive leading institution and advance our capabilities for the future? Our responses to these and other questions will shape the legacy we leave as a community. As we consider these and other questions, we know that the nature of this university demands that our answers always echo our enduring values and fundamental principles and display a level of ambition for the future that reflects our history of achievement. For this, we must be willing to take bold steps. Every member of this university community has benefited from the variety of important contributions of those who preceded us. To respond to the questions and challenges of our time, to successfully articulate and implement an ambitious agenda for the University, every component of the University community must contribute to this effort, so those who follow us will benefit because of our work. Faculty parade their scholastic finery. Twenty-four-hundred years ago, the Greek historian Thucydides described his own work as designed “not to win the applause of the moment, but as a possession for all time.” Let us take Thucydides’ challenge to himself upon ourselves and approach the legacy that has been entrusted to us and the future of the University of Chicago with equal aspiration.